Are you looking for the best pilates mat? Pilates and yoga mats are not identical. Read our recommendations for best mats for dedicated pilates use. We will also recommend dual use mats if you want to try both yoga and pilates. What is the difference between a pilates mat and yoga mat? Yoga and pilates are similar but not quite the same. Because pilates incorporates more groundwork and repetitions, pilates mats are usually thicker than yoga mats. We discuss this in more detail in our article on yoga mat thickness. The main thing you should keep in mind is that a standard pilates mat is about 1/2″ or 12mm thick. A very thick yoga mat is half that at 6mm. A thick yoga mat can substitute for pilates, but you generally shouldn’t use a thick pilates mat for yoga. The extra thickness will provide an unstable base. In terms of traction and grip, both yoga and pilates mats need to provide a good surface. You can expect to get a little sweaty for both exercises. The best pilates mat will have a similar grip to a solid yoga mat. The only exception are mats for hot yoga. Pilates does not have something similar to hot yoga, where you are made to sweat buckets on purpose. 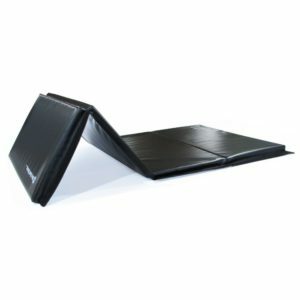 If you are on a budget, we the best pilates mat for you is the Prosource Extra Thick Yoga and Pilates Mat . At a cost of a little over $20, you get a 1/2″ thick mat that measures an extra large 71″ by 24″. The price is similar to a good budget yoga mat, but with twice the thickness. The high density foam provides plenty of cushion for your bones and joints, while still being light enough to carry around. The NBR rubber material also repels moisture and sweat, making it easy to clean by just wiping the surface. The ribbed surface also provides extra traction to prevent slipping. The thick Prosource mat also lays flat on the floor after you unroll it. You won’t have problems with the ends curling, as happens with cheaper or thinner mats. The Prosource pilates mat is more durable and has better quality control than competitors at a similar price point. 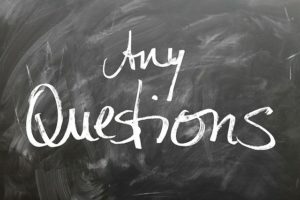 If you check out the reviews of other brands like Spoga, HemingWeigh, and Reehut, you find that many users report that their mats tear easily or even arrive damaged. Prosource offers a “frustration free” packaging option, as other brands often tape up their mats in the delivery box. When users remove the tape, the cheap mats tear! You won’t have this problem with Prosource. Note that despite it’s name, you should NOT use this mat for yoga. 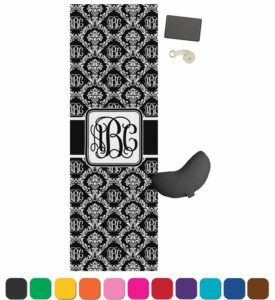 If you want a hybrid mat, we will recommend one below. 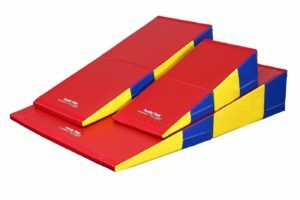 However, if you are solely looking for a pilates mat, the Prosource Extra Thick Mat is an excellent cost-friendly choice. If you want the best pilates mat regardless of price, we recommend going with the Stott Pilates Deluxe Pilates Mat . Stott Pilates is the main brand behind pilates products, and their premium offering combines great quality and features. The Stott Deluxe Pilates mat is extra thick at 0.6″ or 15mm to provide plenty of cushioning. At 72″ x 24″, the mat is also has a bit of extra size to accommodate wide dynamic movements. The material is a combination of closed-cell NBR foam and PVC, which means it is light, durable, and non-absorbent. You also won’t have any chemical odors, like you can get from other rubber mats. We should note that the surface of the Stott Pilates mat is smooth. This is on purpose. Low-end pilates mats can be too smooth or slippery, so they often have to add ridges or extra traction. 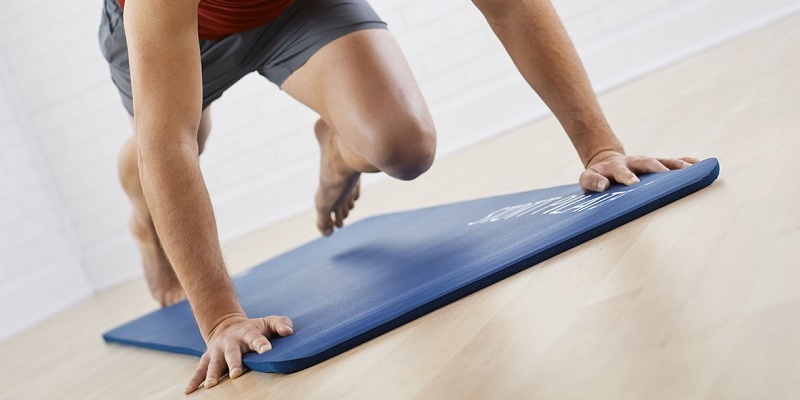 The Stott Pilates mat has a perfect texture of smoothness yet good traction. In fact, experienced pilates users tend to prefer premium pilates mats with smooth surfaces. The smooth surface aids in sliding motions and repetitions. It’s a bit tricky to get a good smooth surface that isn’t too slippery. That’s why we recommend the ribbed surface for the budget-level pilates mat. 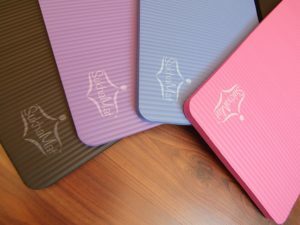 The Stott PIlates Deluxe Pilates Mat, on the other hand, is a high-end product, so the surface is actually superior for pilates exercise motions. 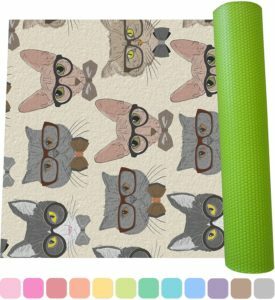 If you really want to get a single mat for pilates and yoga, we would recommend a 6mm yoga mat. The reason is that a 12mm mat is much too unstable and unsuitable for yoga. On the other hand, a 6mm mat is still serviceable for pilates. You might want more cushion, but it is usable. 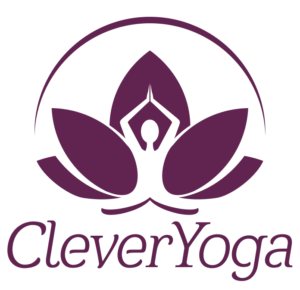 The 6mm yoga mats we would recommend are the Clever Yoga Better Grip at the budget range, or the Manduka PRO Yoga Mat at the premium level. We’ve linked to our previous reviews of these mats. Both of these mats are excellent 6mm thick yoga mats that could double as a pilates mat in a pinch. 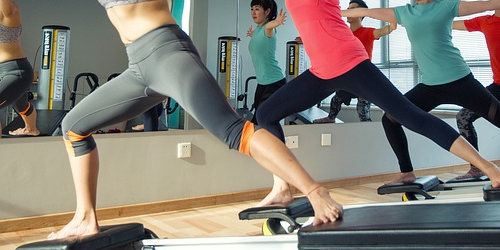 We strongly recommend you get separate mats for pilates and yoga, but if you just want to experiment with both, you could consider these options. We’ve explained the difference between pilates and yoga mats, and then reviewed the best pilates mat at different price points and for different purposes. If you are still uncertain or new to pilates, we recommend you get the cheaper option and see how you like it. Thanks for this. I’ve always been confused by yog versus pilates mats.